I've got a lot on my plate this week, so today's post is a quick one. Namely, it's a map of the neighborhoods of Maradaine where Thorn of Dentonhill takes place: Aventil, Dentonhill and the University of Maradaine. 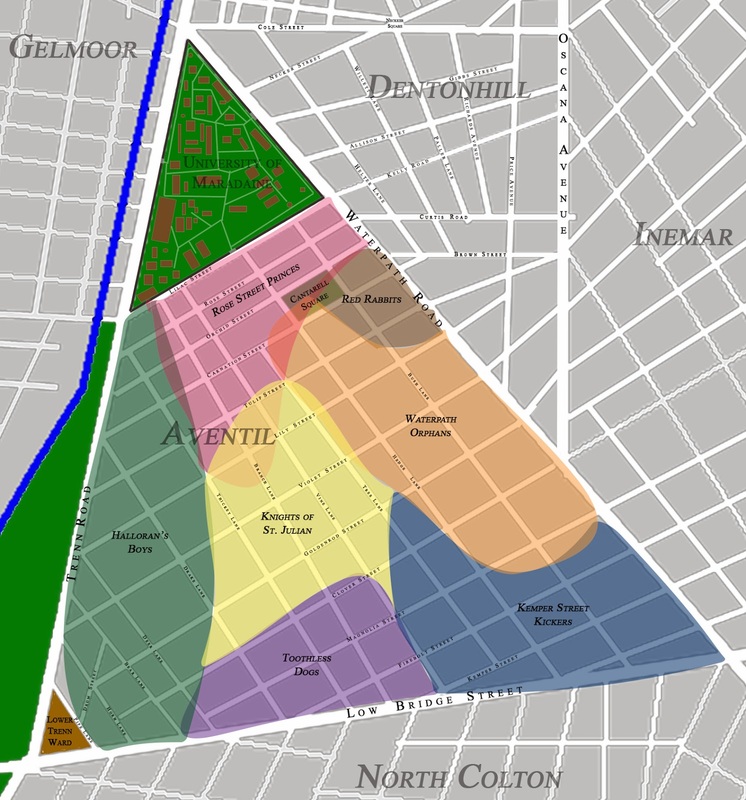 This map also shows the territories of the seven street gangs that dominate the Aventil neighborhood. I don't do the same for Dentonhill because that neighborhood really doesn't have the same divisions. Mister Fenmere controls everything up to Waterpath. But Aventil is a far more fractured neighborhood, as the map clearly shows. All right, into the word mines I go. Later. 1. Book deals for Thorn of Dentonhill, Holver Alley Crew, and Maradaine Constabulary. Well, I did not get book deals for all three. So the highest goal I set did not come to pass. But who knows what tomorrow will bring? 2. Finish Rough Draft of Way of the Shield. Done. 3. Finish Rough Draft of Banshee. About 2/3 to 3/4 done. Not too shabby. 4. Attend my first Worldcon. Which I did, and in being part of the presentation for Rayguns, I had a good reason to be there. So: Done. 5. Have a good reason to start second books of Thorn, Holver Alley or Constabulary. See point 1, as before. I do have them well planned, should that good reason arise in the near future. 6. Hash out some of these random ideas into usable outlines. I actually have done this. I've parsed out characters, worldbuilding, and structure for a piece-- as well as knocking out a few thousand words to start it out-- of a potential future project. 7. Never give up. Yup. So for 2014? Everything about that isn't done, keep doing. Also: I'll be running the Writer's Workshop for ArmadilloCon this year. Expect me to be talking more about that in the coming days. Happy New Year! Good luck in the word mines!